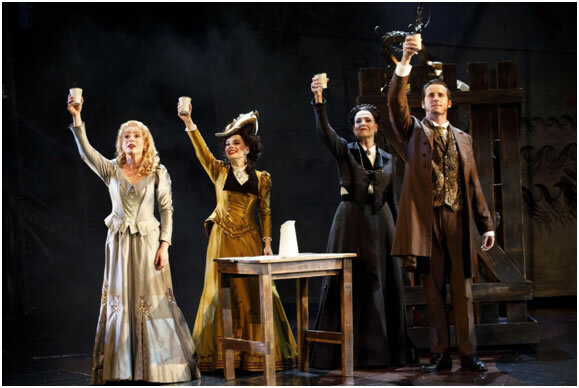 SAN JOSÉ, CA – When on its North American Tour, LOVE NEVER DIES the dazzling new production of ANDREW LLOYD WEBBER (the continuation of the story of PHANTOM) made its San Jose premiere at the San Jose Center for the Performing Arts, curiosity drove the audience to fill the theatre. They were amazed to see what happened. All liked it so much that showed their approval with an standing ovation. In the process of watching the wonderful new spectacle, however, people familiar with music may have discoverd that “LOVE NEVER DIES is not a musical, LOVE NEVER DIES, The Phantom Returns,” is an Opera. Like in a French Opera, the story in LOVE NEVER DIES starts with a Prologue. It takes place in a dark smokey room, somewhere in Coney Island, where Phantom, sitting at his organ saying "Christine" as he stares at her portrait on the wall. He tries to compose a song, at the organ several times, but he is unable to play more than three notes, so he begins singing the doleful song “Till I hear you sing” in which he reveals that he “hears the music in his ears” but that his music has no voice, and that it will continue voiceless until he hears Christine sing. 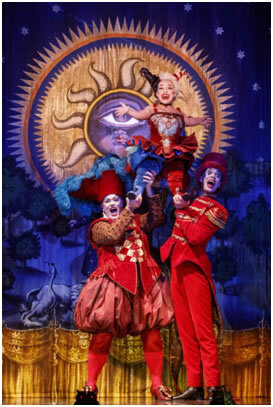 The pathetic atmosphere, changes when a doll clown, dressed in a red military outfit, on top of a music box on the floor, becomes alive and begins singing "Coney Island" a happy song describing the place.His song becomes a trio, when he is joined by another man, and a midget cute girl. The song transports the audience to the magical world of “Mr. Fantasma” a mixture of a Fair and a Circus, populated by clowns, acrobats, giants, midgets, fat men, masked people, all wearing colorful costumes. All singing and dancing. PHANTOM’s show in Coney Island is called "MR. FANTASMA" and it is shown inside a carp. illuminated by the bright lights of a Ferris Wheel and a Merry-go-round spinning in the background. His spectable's performers are a group of young French dancers, doing what, for the time, may have been considered a a risqué dance (boarding on phonographic) because the girls in short feathered skirts, not only show their bare legs, but Meg, the principal, simulates stripping at the end of the dance. They sing as a chorus, as they dance. Their song, "Only for You" may have double meaning, because it says in its lyrics: "We can do everything. Only for You"
The star in the group is Meg Giry (MARY MICHAEL PATTERSON pictures at the center being raised by two clowns) which we may remember from PHANTOM as Christine’s friend at the Paris Ballet. We learn that her mother, that we only know as Madame Giry (KAREN MASON), is, as she was in the Ballet of the Paris Opera, the Dance Captain of the dancers. The other two previously known characters on this story, are Phantom's protegee, Christiane Daaé (MEGHAN PICERNO) and her now husband Raoul, Vicomte de Chagny (SEAN THOMPSON). 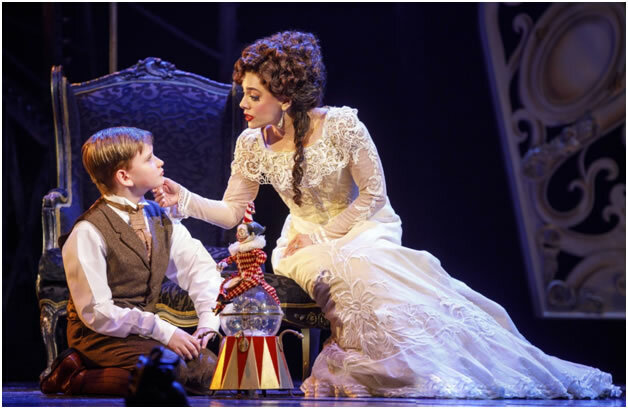 LOVE NEVER DIES is set in motion, when by now a famous singer, Christine (PICERNO) her husband (THOMPSON) and her little boy Gustave (JAKE HESTON MILLER) arrive in New York invited by Producer OSCAR HAMMERSTEIN, who wants her to sing at the opening of his new Manhattan Opera house. When PHANTOM learns that the reason that she is singing in New York is because she is broke, after her husband,the Vicomte de Chagny, lost all her money gambling in the casino of Monte Carlo, goes to where she is staying and offers her double what HAMMERSTEIN was going to pay her, if she sings an original song he wrote in Mr Fantasma's show. Because the "show" is not for her, her husband objects and demands they go back to Paris. Christine knows they need the money. She has to decide what to do. LOVE NEVER DIES, uses short dialogues. It advances musically, like in an opera. The story is told in duets such as Mother Did you See? In which Meg tells her mother that she thinks that if Chistine sings in Mr. Fastasma’s tent, she (who is the star in the show) will lose her place. In her duet-like song Madame Giry, starts remembering the past. In her lyrics given the audience the impression that she may be in love with Phantom, because when talking about him she says, "Who we admire and we love." In the same song, she expresses that she feels hurt by Phantom's betrayal. Reminding her daughter that she was the one who hid Phantom in Paris to save him from being lynched by the mob. The one who smuggled him in a ship, and the one whomade possible for him to come to Coney Island. It was her taking to the investors what made it possible for him to open his theatre. That she was the only one who has been at his side all these years. She then criticizes Christine for doing nothing from Phantom, and choosing youth and beauty, in Raoul, instead of Art and the genius of Phantom. 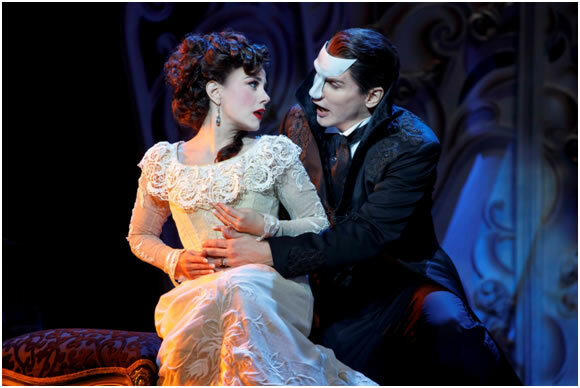 She is hurt, because she cannot understand the reason why, when Christine, who disappeared from sight when Phantom was in trouble, re-appears in his life, and he gives her the star’s place in his show. And another duet moves the story further, when Christine an Phantom meet, and both sing the songs Once Upon Another Time and “Beneath a Moonless Sky” and we the audience get to know them better as both reminisce of the night in Paris, when because it was dark and Christine could not see his (deformed) face, the woman, in her, met the man in him. LOVE NEVER DIES is music. Beautiful lyric music telling a love story in songs. And like an opera, some are solo arias, such as Why does she love me? In which Raoul (THOMPSON) wonders why Christina Loves him, ( a gambler and a drunk) contrasted with choruses such as Bathing Beauty, a dancing/singing number who diverts the drama of the story for a few minutes. And again, relating the musical's structure to the structure of a French Opera we could add that LOVE NEVER DIES the title song of the work, is a Waltz, which at one time was required in every Opera. 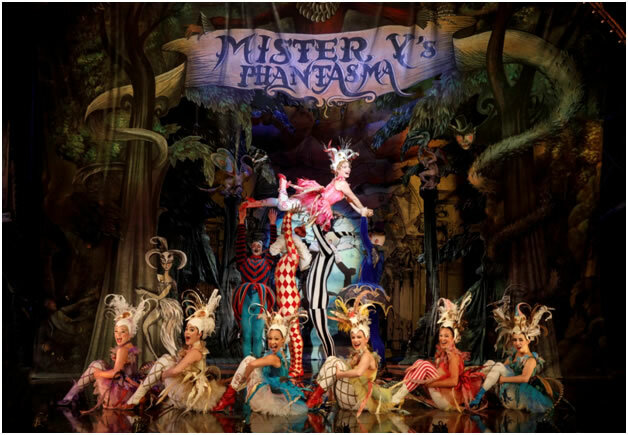 And the required dance, (not a ballet) and also has a Leit Motif (A segment of a song which identifies the appearance of a character) which is heard when the stage is dark, filled with smoke to indicate the future appearance of Phantom. So, is LOVE NEVER DIES an opera? Those who loved the story of PHANTOM will love its sequence. It is well acted, has colorful costumes, spendid sets, and moves seamless from beginning to end. As for its music, those who loved “The Music of the Night” will delight in the the gorgeous melodies that WEBBER composed and orchestrated for LOVE NEVER DIES, the Phantom Returns. And, as for the plot, dramatically speaking, the plot of LOVE NEVER DIES surpasses the plot of PHANTOM. LOVE NEVER DIES will be shown at THE SAN JOSE CENTER FOR THE PERFORMING ARTS, 255 S Almaden Blvd. in S.J. until March 18. For tickets you can go online to www.broadwaysanjose.com or order by phone by calling: (800) 982-2787.